Southfield, Mich., May 2, 2017...Vehicle-related failures can be frustrating. Many can be expensive, and some might even be downright embarrassing. But thanks to Federal-Mogul Motorparts' popular annual #PartsMatter Sweepstakes, 12 auto-related "fails" each month from now through October will qualify for gift cards of $100 or $500 (USD). Open to consumers throughout the U.S. and Canada, the #PartsMatter Sweepstakes encourages consumers to share photos or brief stories about their latest vehicle troubles at www.partsmatter.com to help communicate the importance of choosing the best replacement parts for any vehicle repair. The monthly sweepstakes is part of an extensive multi-media campaign to help millions of consumers, in collaboration with their automotive parts and service providers, make informed decisions about the parts used in a full range of vehicle repairs. "Consumers have many choices when it comes to selecting replacement parts for their vehicles," said Laura Soave, senior vice president and chief marketing and communications officer, Federal-Mogul Motorparts. "The #PartsMatter campaign was established to remind consumers to protect themselves from the potential risks associated with inferior parts. Many of these parts might look quite similar to a high-quality product from a trusted brand, but there can be dramatic differences in performance reliability and even safety." 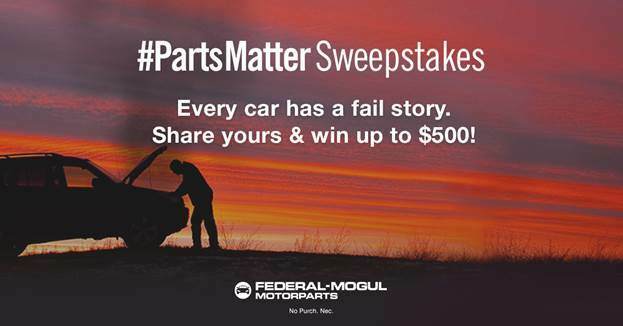 The 2017 #PartsMatter Sweepstakes will award 10 $100 gift cards to participants selected at random who have shared qualifying photos or brief stories documenting vehicle-related "fails." Federal-Mogul Motorparts will also select two monthly grand-prize winners – one for best photo and one for best story – to each receive a $500 gift card. Grand-prize winners will be selected based on relevance to the #PartsMatter theme, creativity and originality, and overall quality of entry. Nearly 6,000 "fails" were shared through the program in 2016. Federal-Mogul Motorparts is a leading global supplier of premium-quality automotive replacement components. The company's product range includes MOOG® steering and suspension parts; Wagner®, Ferodo® and Jurid® brakes; ANCO® and Champion® wipers; Champion spark plugs, filters and batteries; Wagner lighting; Fel-Pro® gaskets; National® seals; and Sealed Power® and Speed-Pro® engine parts. These products are available through leading auto parts providers and vehicle service businesses throughout North America. To learn more about the #PartsMatter campaign and sweepstakes, please visit www.partsmatter.com. NO PURCHASE OR PAYMENT NECESSARY TO ENTER OR WIN. Sponsor: Federal-Mogul Motorparts LLC, 27300 W 11 Mile Road, Southfield, Michigan, 48034. Full rules and entry details available at www.PartsMatter.com/Sweepstakes.html. Starts on May 1, 2017 at 12:00:01 am ET and ends on October 31, 2017, 11:59:59 am ET. Multiple entry periods. Open to legal residents of the 50 United States, the District of Columbia, and Canada who are 16 years or older at the time of entry. Void where prohibited. 12 contest prizes available (2 per entry period), each consisting a $500 gift card; 60 sweepstakes prizes available (10 per entry period), each consisting of a $100 gift card. Odds of winning a sweepstakes prize depend on number valid of entries received prior to each draw date. Odds of winning a contest prize depend on number and quality of valid of entries received prior to each judging date. Skill-testing question required for Canadian residents.